Much of the building’s exterior is clad with panelized brick cladding and store-front windows. The leakage was causing the building’s steel structure to corrode. 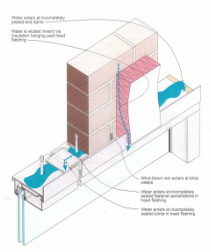 The PL:BECS report included graphics to help explain specific infiltration pathways. 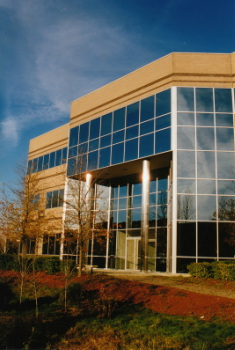 Project Summary:	This 3-story, steel-framed office building’s exterior walls included site-built brick veneer along the building’s lower portion as well as panelized brick cladding at upper floors, and store-front as well as curtain-wall window systems. The building began experiencing widespread and profuse leakage shortly after its construction, and this leakage persisted in spite of various corrective attempts, making it appear intractable. In phase 1, PL:BECS evaluated all of the building’s enclosure systems to determine sources of the leakage, identify all other flaws, and outline general corrective approaches. This investigation revealed that the vast majority of the leakage related to inadequate flashings at the heads of the window systems within the panelized brick cladding. Additional major contribution to the leakage resulted from inappropriate use of store-front window systems where curtain-wall windows should have been used. Phase 2 of PL:BECS involvement included expert-witness testimony in the subsequent litigation process. This input was instrumental in reaching an equitable settlement between the various parties which provided our client with the funding needed to execute corrective measures.